The Free Festival began in 2004, when Laughing Horse Comedy promoters Alex Petty and Kevin McCarron started to run and produce shows at Linsay's venue just outside of central Edinburgh. Prior to this they had visited the Fringe on a number of occasions, and realised the traditional way of producing shows wouldn't work for them, with performers losing £1000's a year and performing to small audiences as ticket prices were so high. The Fringe was just not working for its performers. During these visits to the Fringe prior to 2004 they had seen a free show run by eccentric comedian Peter Buckley Hill, and saw how that operated: by getting a large audience by not charging in advance, and with money being made with a collection being taken at the end of the show - an idea that had been taken from what buskers had been doing for many years, and essentially moving the busking indoors. Which with Scottish weather, is a very good idea! Initially Alex and Kevin worked in a partnership with Peter, expanding the original concept into a festival with multiple shows and venues, which gradually gained popularity and expanding quickly. Unfortunately this partnership was not to last, and in 2006 Alex and Kevin decided to end the partnership. Since then, the Free Festival programme of shows has expanded very rapidly, with our free format becoming ever more popular each year. The first nominee for the main comedy awards was a Free Festival show, and over the years the number of awards winners and five-star rated shows has shot up to be on a par with paid venues. But the Fringe is not all about award winners, and we still remain true to our roots by supporting and helping newcomers and new ideas - that is what a Fringe is really about. 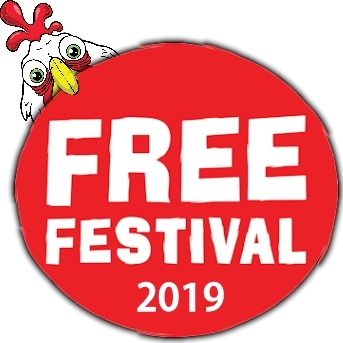 Now the Free Festival has 19 venues and more than 30 performance spaces, encompassing venues managed by both Laughing Horse, new company 'Heroes of the Fringe' and independent shows and producers. The concept of our venues is to provide an alternative to increasing prices for performers and audiences at the Edinburgh Fringe. Free to us is not only a price point, it also means creative freedom for performers, and the freedom for performers and audiences to choose what shows they perform or see. To provide professionally set-up and managed Fringe venues, where there are no charges for audiences to watch shows, and no charges for performers to hire the performance spaces. To allow performers to 'do the Fringe' without the substantial losses traditionally incurred at the large venues. To allow performers to enjoy the Fringe again - by trying to provide a community atmosphere and a support network from fellow performers, and also allow performers to get on with what they should be doing (performing) without the financial and business worries of the traditional approach to the Fringe, or the more chaotic approach to free shows where performers also have the responsibility of building their own venues. To grow and develop Free performances across the Fringe, while supporting and working with other venues, promoters and performers that offer good value for performances. To work with the Fringe to make things better, not to work against it. To try and make sure that everybody performing in our venues has a successful Fringe - for them to come back from the Fringe having developed as a performer, achieved their objectives for taking a show to the Fringe, and enjoyed their time in the venues. The Edinburgh Fringe was founded in 1947 by a number of performers who simply turned up at the Invitation-only Edinburgh International Festival, and put on their own shows, creating a Fringe Festival around the International Festival. Over the years since then, the Fringe has continually expanded, but has still kept its original premise: an arts festival open to anybody who wished to take part. But problems have arisen for performers and audiences in recent times. These are partly due to the Fringe's popularity, and partly due to promoters and venue owners who have upped the cost of hiring spaces, and who have secured more and more locations, making it a closed market for performers finding spaces. Originally, it was an open arts festival that anyone could take part in - recently it started to become an open arts festival that anyone can take part in — as long as they could afford it. In recent years the costs associated with bringing a show to the Fringe the traditional way have spiralled. In some circumstances, a performer can sell all the tickets for all the nights at his or her venue and still make a loss, with the biggest complaint by Fringegoers being the high price of tickets. Fringegoers have blamed artists for the high ticket prices, but it’s usually the venue who sets the prices, often against the wishes of performers. What does this mean? The more a show costs, the less people are willing to take a chance on it. If a show featuring an unknown artist costs less than £5, you may take a chance on it If the same show costs over £10, you probably won’t - A Fringe needs to be cheap so is accessible, or else people will merely see the performers who are already famous — and they don’t need a Fringe! The only shows that put money in the pockets of the artists are usually the shows of the already famous. Website Database Application Design and Development - Craig Shaynak and Kingswell Productions. (craig@kingswellproductions.com). with additional page design by Alex Petty. Set-up and General Help - Paul Revil, Robyn Perkins, Dave Chawner, Andrew Roper, Nik Coppin, Gemma Coles and all of the performer volunteers. Organising Group and volunteers - Craig Shaynak, Nik Coppin, Ian Fox, Rob Coleman, Barry Ferns and all of the volunteers that help in the days before, during and just after the Festival. Free Festival UK Office: 020 3287 5533 (or +44 20 3287 5533 from outside of the UK). This number will route to the London or Edinburgh Free Festival Office. During the Fringe we can be contacted via: Espionage, 4 India Buildings, Victoria Street, Edinburgh, EH1.